The coronation proceedings were immediately initiated by Bharata. Skilled barbers removed the matted locks of Rama. He had a ceremonial bath and he was dressed in magnificent robes and royal jewels. Kausalya herself helped the vanara ladies to dress themselves in royal robes; all the queens dressed Sita appropriately for the occasion. The royal chariot was brought; duly ascending it, Rama, Laksmana and Sita went in a procession to Ayodhya, Bharata himself driving the chariot. When he had reached the court, Rama gave his ministers and counsellors a brief account of the events during his exile, particularly the alliance with the vanara chief Sugriva, and the exploits of Hanuman. He also informed them of his alliance with Vibhisana. At Bharata's request, Sugriva despatched the best of the vanaras to fetch water from the four oceans, and all the sacred rivers of the world. The aged sage Vasistha thereupon commenced the ceremony in connection with the coronation of Rama. Rama and Sita were seated on a seat made entirely of precious stones. The foremost among the sages thereupon consecrated Rama with the appropriate Vedic chants. First the brahmanas, then the virgins, then the ministers and warriors, and later the businessmen poured the holy waters on Rama. After that the sage Vasistha placed Rama on the throne made of gold and studded with precious stones, and placed on his head the dazzling crown which had been made by Brahma the creator himself. The gods and others paid their homage to Rama by bestowing gifts upon him. Rama also gave away rich presents to the brahmanas and others, including the vanara chiefs like Sugriva. After witnessing the coronation of Rama, the vanaras returned to Kiskindha. So did Vibhisana return to Lanka. Rama looked fondly at Laksmana and expressed the wish that he should reign as the prince regent. Laksmana did not reply: he did not want it. Rama appointed Bharata as prince regent. Rama thereafter ruled the earth for a very long time. During the period of Rama's reign, there was no poverty, no crime, no fear, and no unrighteousness in the kingdom. All the people constantly spoke of Rama; the whole world had been transformed into Rama. Everyone was devoted to dharma. And Rama was highly devoted to dharma, too. He ruled for eleven thousand years. Amidst these reflections, King Dashrath proceeded to the hermitage of Vasishtha, the family preceptor, with a view to seeking his advice on Ram’s coronation. Approaching him, he said, “I have come to seek your advice on a very important matter, O revered saint. I feel that Ran is by all means capable of shouldering the burden of the administration of my kingdom. Shouldn’t I get rid of all worldly responsibilities after handing over the throne to him and lead the remaining life in penance? “What a splendid idea indeed! But any decision concerning the coronation can be taken only after consulting the nobles and other respectable persons of the kingdom,” retorted the saint. “It is by all means desirable. I would return to Ayodhya and convene a meeting of the courtiers to take a decision in the regard. I implore you to come and bless us all with your esteemed presence,” said the king. 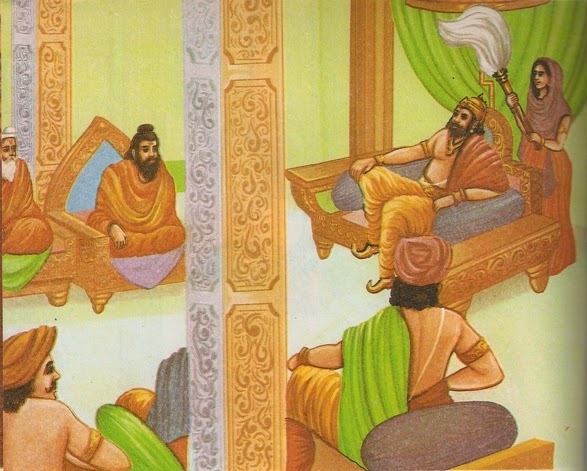 The very next day, King Dashrath summoned a meeting of his nobles. Saint Vasishtha, too, was present there. The king addressed the courtiers and said, “I have been running the government of the kingdom in keeping with the traditions laid down by my revered forefathers as best as I was able to do. But I have grown old and so I want to put the responsibility of the state-affairs on the shoulders of Ram, my eldest son. This meeting has been convened to know the opinion of you all. If you feel it to be advisable and if you support my suggestion, I would declare Ram as my successor and he will be crowned king on an auspicious day. The royal preceptor-Vasishtha- also supported the decision saying that Ram was tolerant like the earth, wise like god Brihaspati and as brave as god Indra. 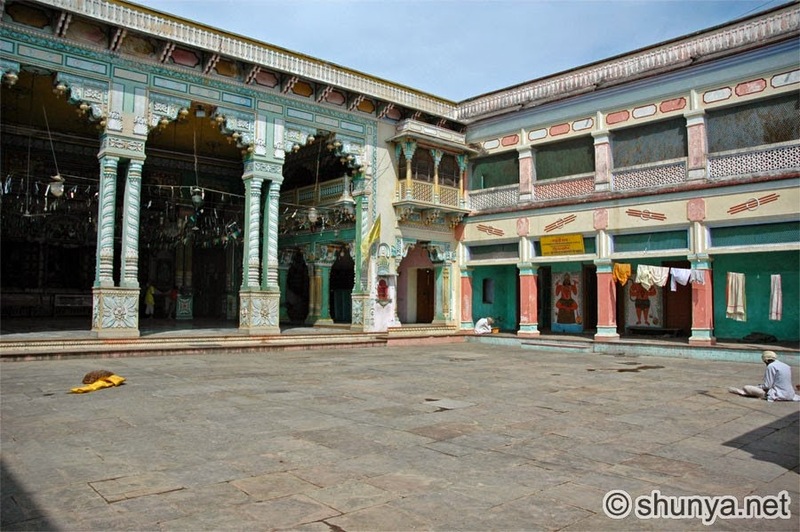 All this is said to have taken place in the palace of Dasharatha, which is located in Ayodhya. Meaning: "This body has been living for many thousands of years. Hence I desire rest." Meaning: "Joyfully, I shall appoint Rama, who shines like the moon together with Pushya star, who is the best among the protectors of righteousness and who is an excellent man, to the realm of prince." Meaning: "I am telling this after lot of thinking. Give consent to me if you feel this to be good and befitting. How else shall I do it?" Meaning: "In conducting the kingdom for benefit of the entire people, my body became impaired under shade of the white umbrella." Meaning: "This is my desire. Yet, let there be thinking on any other beneficial way. Thinking by impartial neutral people will be distinctive and well developed through grinding of opposing views." Meaning: That building appeared trembling by the sweet and reverberating sound made by the gathering of people there with their fond uproar. Meaning: "Oh king! You are an elderly person with thousands of years of age. Hence, inaugurate Rama as the ruling prince." Meaning: "Why do you desire to see my son as the prince, when I am ruling this earth with righteousness?" Meaning: Those kings together with urban and rural citizens after hearing those words spoke to the great soul Dasaratha as follows: "Oh king! Your son Rama has many auspicious virtues". "Oh king! We shall tell you now the various virtues of your wise son, listen to them. His qualities are equal to those of celestials. They are liked by all. They give happiness to all. Rama is equal to Devendra in heavenly qualities. He has true valor. He is greater than all the kings born in Ikshvaaku clan. Rama is the world renowned gentleman. He is keenly interested in truth and righteousness. Only Rama can make both righteousness and wealth combine without separation. He is equal to moon in making the people happy; equal to the earth in the quality of forgiveness; equal to Brihaspati in wisdom and verily to Devendra in valour." "Rama knows all righteousness. He is true to his word and has good character. He has no envy. He has patience. He consoles those who are in troubles. He speaks good words. He has gratitude. He keeps senses under control. Rama is soft natured; has stable mind, always an auspicious man, and has no envy. He speaks truthful and loving words to all living beings. He worships aged Brahmans endued with the knowledge of various sciences. By that, his name, glory and splendor are growing in this world." "He is skilled in the use of various weapons known to celestials, demons and men. He has duly concluded his vow of studying the various sciences and has systematically learnt all the Vedas along with its branches. *"
* Branches of Vedas: - (six in number): 1.Siksha or phonetics 2.Vyakarana or Grammar 3. Chandas or Prosody 4. Nirukta or Etymology 5. Jyautisha or Astronomy 6. Kalpa or the branch of knowledge prescribing the ritual and giving rules for the ceremonial or sacrificial acts. "Rama is best in the world in the art of music. He has best relatives. He is gentle. He is not weak in mind. He has great wisdom. Rama was trained in all matters from the best of Brahmans skilled in the art of righteousness and in the science of political economy. If it is necessary to go to a battle to protect a village or a city, Rama goes with Lakshmana and returns home only after obtaining victory." "After returning from battle, Rama goes to citizens on an elephant or a chariot and inquires about their well being as though they were his own kinsmen, like a father does to his sons. He asks about their wives and children, about the sacred fires, about their servants and students, always completely as per the due order. Rama the best among men always asks us 'Are your disciples serving you by keenly performing their actions?' "
"Rama feels very sad towards afflictions of men; and feels delighted in all functions celebrated by people on the occasions of child birth and the like, just as their own father does. Rama speaks only truth. He is a great hero. He serves elders. He kept the senses under control. Rama, who talks smilingly, protects righteousness in all ways. Rama duly procures beneficent deeds. He is not interested in wrangling talks. He is an orator like Brihaspati by his replies and rejoinders." "Rama, who enchants the world, has beautiful eyebrows. He has red and broad eyes. He is absolutely like the God Vishnu himself in strength, heroism and valour. He knew the ins and outs of public administration. His senses are not afflicted by passion. He is capable of administering not only earth, but also the three worlds. Rama's anger or mercy is not arbitrary at any time. He kills those who are to be slain as per rules. He is not angered at the innocent." "He gladly bestows wealth to those with whom he is satisfied. As the sun shines by his rays, Rama shines by his qualities that are peaceful, which are enchanting and delightful to men. All people desire Rama, who is endowed with this wealth of qualities, who has true valour, who is equal to presiding deities like Devendra, to be their lord." "Oh king Dasaratha! Rama is born to you as a son, because of your good fortune, for the welfare of this world. He has all the virtues befitting of a son, like Kasyapa, the son of Marichi. All people in the state including those in the capital as well as those in the nearby and in the far off places, pray for long life, health and strength of Rama of reputed nature." "Both young and aged women are praying with a stable mind each morning and evening to all celestials, for the benefit of renowned Rama. Oh best of kings, Dasaratha ! We shall see Rama adorned with princely kingdom. Your son Rama has the complexion of a black lotus flower and annihilates all his enemies. Let the wish of the people be fulfilled by your grace. Oh fulfiller of people's desires, Dasaratha! For our benefit, you gladly and immediately inaugurate your son Rama, who is equal to Vishnu, who is interested in the welfare of the entire world and who is possessing the best of virtues."